The Lifefactory 9oz. Glass Beverage Bottle is a great size for kids! The glass bottle features the silicone sleeve which help to protect against breakage. The 9oz. Beverage Bottle also has a easy to twist on or off solid cap. This is a great glass alternative for lunch boxes and kids on the go. 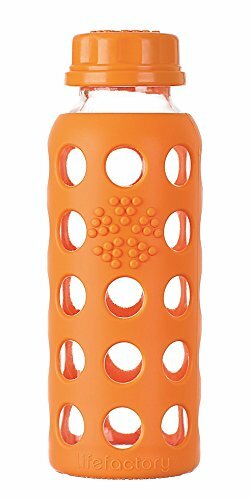 Lifefactory bottles have a bright colored silicone sleeve (patent pending) that helps to protect the bottle from breakage and provides a great gripping surface. Bottle and sleeve can be boiled or put in the dishwasher together. Can also go in the freezer. Lifefactory 9-ounce (250 ml) reusable glass water bottles are perfect for kids’ lunchboxes and lightweight on-the-go hydration. The compact bottle comes with a leakproof lid and fits easily into handbags, backpacks, and car cup holders. Providing an excellent alternative to disposable plastic bottles, these innovative bottles feature durable glass construction that offers pure taste. The bottle’s glass is surrounded in a patented silicone sleeve that both protects against breakage and provides a comfortable, non-slip gripping surface. For easy care, the silicone sleeve and bottle can be washed together. All components of the bottle are dishwasher safe. It is recommended to wash the cap on the top rack. The cap is constructed of BPA/BPS-free polypropylene (PP#5) with no phthalates, PVC, or polycarbonates. All Lifefactory components are made in the USA or Europe and all products are assembled in the USA.